Large Props for Live Events | designscape, inc.
Are you thirsty for a branded event? LARGE PROPS FOR PROMOTIONAL AND EXPERIENTIAL MARKETING – Make an impact on your product rollout with large-scale props that speak to your audience. 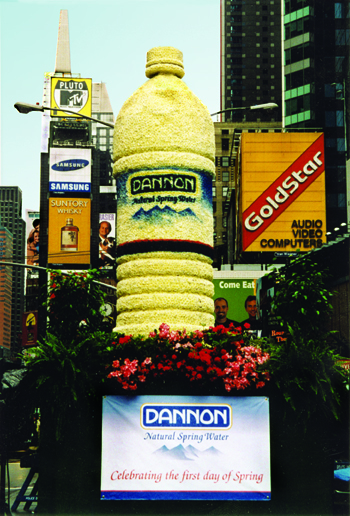 We designed and built a 27′ tall bottle covered with 11,000 Crystal Chrysanthemums and staged it in the middle of the military island in Times Square on the first day of Spring.